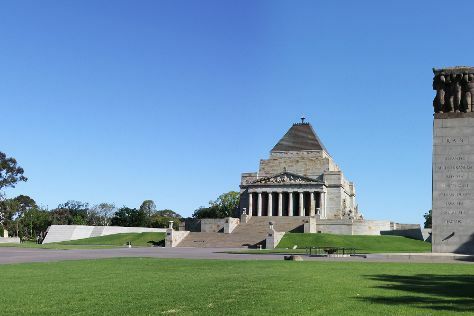 Get some cultural insight at Shrine of Remembrance and National Gallery of Victoria. Change things up with a short trip to The Great Ocean Road in Torquay (about 1h 40 min away). Dedicate the 24th (Wed) to wine at some of the top wineries in the area. And it doesn't end there: see the interesting displays at Melbourne Museum, contemplate the long history of Old Melbourne Gaol, enjoy breathtaking views from Eureka Skydeck 88, and take in nature's colorful creations at Royal Botanic Gardens. To see where to stay, other places to visit, reviews, and tourist information, read Melbourne holiday planning website . If you are flying in from Germany, the closest major airport is Melbourne International Airport. In April, daily temperatures in Melbourne can reach 23°C, while at night they dip to 11°C. Finish your sightseeing early on the 27th (Sat) to allow enough time to travel back home.